Shortly after moving to Dallas I met an amazing woman, Teri Rice. We became fast friends, and now I call her my "TX mom." Texas didn't seem so far away from home after she invited us into her family. I soon found another reason why we were meant to be friends. 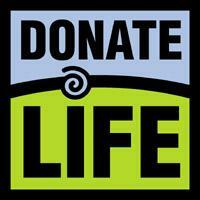 Her husband, Van, is a heart recipient and they are both advocates for organ & tissue donation. Ellen, their youngest child, and I were talking a few weeks ago about health care, as she is currently in nursing school. Our conversation naturally led to organ & tissue donation and her dad. We talked about how organ donation has changed her life and how different her life would have been without the gift her family was given. On January 26, 1994 Van, then 33, went to a doctor thinking he had bronchitis, but after a chest x-ray discovered his heart was enlarged. The next day after testing, they found out it was congestive heart failure. After a 10 day stay at Medical City, Dallas, testing determined he could be a heart transplant candidate. He was able to return home, but his health continued to decline. Trevor, their oldest, and Ellen were 5 and 2 1/2. They could not comprehend the enormity of the situation. Van's Cardiologist, Dr. Bonnie Floyd, sat down with the children to show them a model of the heart and explained that their Daddy's heart was too big and it needed to be replaced. Teri says nothing but praise of their Cardiologist, "She was amazing with these little guys, a sweet Christian woman who went above and beyond to help me talk to these little ones in a way that would help them 'understand' what all the commotion was about around our house!" On February 17, Van went back to Medical City to receive medication that would keep his heart pumping. He then stayed at Medical City until transplant day, March 3, returned home 8 short days later and has been thriving since! My name is Ellen and your generosity and selflessness has given me 19+ years of knowing my Dad. Your son’s heart gave my Dad a second chance; a second chance to see my brother and me grow up and a second chance to be part of our family. I was two when he received your son's heart and I was just starting to talk—my older brother used to talk for me so I really didn’t have to. I was too young to truly know who the man I called Dad was. I didn’t know that my Dad loved to fly airplanes and play guitar. I didn't know how crazy in-love my Dad was with my Mom. I didn't know his passions, his heart, or how sarcastic he could be sometimes. I knew him as my Daddy, and frankly none of the other stuff mattered at the time. But it matters now. And if it were not for your gift, I would have missed out on his wicked sense of humor and his generous heart. Because of your selflessness, there were the big moments that my Dad was able to see; like birthdays, anniversaries, and graduations. I would have missed having him there for those special days, but I also would have missed out a lot of the day-to-day things. I would have never heard his daily guitar playing, which I miss now being away at college. I would have missed his daily hugs and occasional kiss on the forehead and playing thumb-wars while we would wait on a table at a restaurant. I would never have known where his "itchy spot" was--the spot on his back that he always liked scratched and when I was younger he would give me a dollar to scratch, yes a whole dollar. My dad has been a huge influence on my life, and still is. When I have a really bad day—I call him. When I need advice—I call him. He has supported me and loved me and I can’t imagine—I don’t even want to—what my life would have looked like without him in it. Your gift gave me a childhood, and now adulthood, filled with my Dad—and no amount of thanks can truly cover my gratitude. So please, as you consider organ & tissue donation, consider the impact you can have and the legacy you could leave. You may not only help a recipient, but allow a daughter to know a father. A wife to spend 19 more years with her husband. And you may never know what love may be brought to this world, just through one selfless act. Visit here to register in your respective state.